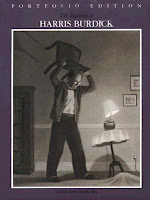 The introduction to The Mysteries of Harris Burdick explains how a mysterious man - Harris Burdick - arrived at a publishing company one day many years ago and shared fourteen images, each with a caption and each from a different story. 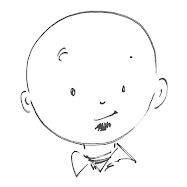 Mr. Burdick explained that there were many other pictures for each story and was curious if his work was of any interest to the publishing company. The man Mr. Burdick spoke with, Peter Wenders, said he was indeed interested in the stories based on these phenomenal and fascinating images. Leaving the fourteen images, Mr. Burdick promised to return the following morning with the complete stories. He never arrived, and Mr. Wenders never heard from Harris Burdick again. Eventually the fourteen images, the story titles, and their captions were published as this book, The Mysteries of Harris Burdick. But without the complete stories, readers are left to fill in the ginormous gaps with their own imaginations. In the twenty-seven years since it’s publication, readers have done just that, creating adventurous, horrifying, mysterious, touching, mystical - and wholly personal - stories of their own based on Mr. Burdick’s incredible images. Many people have written them down, but most stories live only in the imaginations of the readers, free to evolve with each reading and each imagining. Teachers and parents will love this book. It moves the imaginations of students and children, inspiring creative writing and storytelling for a long time after reading. Now comes The Chronicles of Harris Burdick. Fourteen award winning authors were invited to create their own stories based on the original images in The Mysteries of Harris Burdick. Click here to read my review of this new collection based on Harris Burdick’s original work. Great story! Thanks for sharing. I wonder if they would buy into the back story of The Chronicles of Harris Burdick as well. Just don't tell them that it was written by Lemony Snicket.